Dad, How do you do it? Dad, left (above) 1997 Athens,Greece. 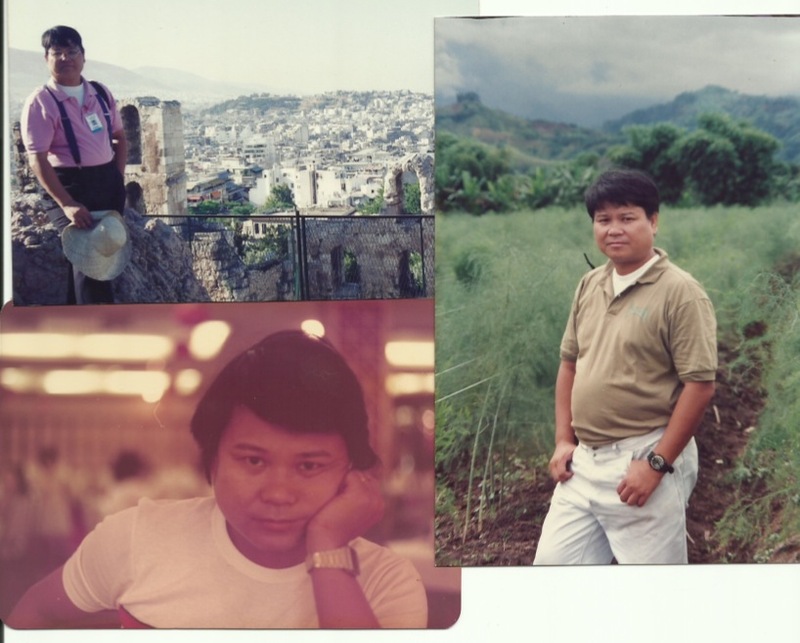 Right, Doing the FPJ Pose traveling around the Philippines & My Young Dad (below)Respected Journalist and Columnist for Strait Times, Singapore, 1983. How do you balance your busy life, Dad? You have chosen to leave the employed world, gone entrepreneurial, took the sabbatical leave and yet still juggling consultancy jobs. You find the dishes and laundry calming, have the patience as you run around to play with the dog who’s been barking for food or your dry-cleaned apparel still waiting at the back seat of your car. Waking late nights, having so much engagements squeeze in-between and yet accomplishing deliverables. When will you say “enough is enough”? But you’ve been handling it so well, you get to Schedule regular activities to de-stress and marking it on top of the priority list. Campaigns in Manila, Philippines and also working closely with OWWA and PCCI who took the leap outside the employed world and choose to be a father and still remain to be a provider of his children. As Steven Covey says in his life changing book, “The 7 Habits of Effective People”, Sharpen the Saw: Taking good care of yourself first guarantees work at a much higher level. What does he do to de-stress even in between working on his deliverables, and spending time with his family? Here are few observations I found specific that made a huge difference in balancing out his busy life. Waking up as early as 4:00 am to do some breathing exercises, walking and sweeping off the leaves in front of the garage and around the garden. A morning everyday ritual with the news on; trying to relax through to start the day right while media monitoring the radio interviews and mentions about the stories he’s building up for his clients. A good lung exercise, cardio and movement based work out. Mangoes, Avocados, Bananas and all kinds of fruits. You have no idea how much he adores and indulge on fruits. He can live eating fruits alone and won’t ask for meat even if he’s a heavy carnivore. He says, this is how he grew up. Fruits were picked from the trees and vegetables planted. No wonder we have 5 mango trees outside. Aside from eating, you’ll find him carrying his film dslr, my camera or his new canon dslr wherever he is. No wonder we have a library of photos alone together with his books. Photography and traveling has become his favorite hobby. Who’d get stressed when you’re working at the same time capturing the beauty of the world and get to document moments with your family? I’d have to agree. I’ve become a shutter-bug myself but I’ve yet to beat his record on cross-processed films with this technolog-filled generation we have. There’s no room in acknowledging hard times. Recognize reality but one shouldn’t dwell on the challenges as there are always ways to cultivate and survive. A positive disposition will always drive you to the right motivation and enjoy every project you’re about to start and finish. Since I gave my father the book and the podcasts of the Law of Attraction, this has become a staple beside his bed table and in his bag. He takes it with him everyday along his pen and paper for his thoughts. When you have a ton of work, it’s easy to give in to temptation and skimp on sleep. Whether in finishing assignments, paying bills or catching up on household tasks you’ve put off, there’s always a better use of your time rather than just lying in bed? Wrong. Don’t underestimate the power of sufficient, quality sleep to rejuvenate energy. This jack-of-all trades is asleep by 10:00pm or sometimes by 8:00pm not unless there’s American Idol, Glee and his daily CNN news to complete his day. Sorry Dad, I just had to share your secrets. Work is important,but so are you. Balance your busy career with specific and regular activities that will de-stress you to sustain and rejuvenate your body and mind. You won’t just feel good but you’ll also get to have fresh eyes for all the editing, get the energy for your presentations and look great in front of your clients and still have reserved energy for family bonding.